Wikipedia states that the name "alligator" is probably an anglicized form of el lagarto, the Spanish term for "the lizard", which early Spanish explorers and settlers in Florida called the alligator. Alligators are native only to the United States, mostly in the southeast United States, and China. Alligators are generally timid towards humans and tend to walk or swim away if one approaches but not this 10-feet alligator. 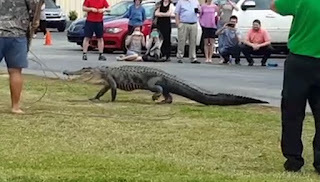 Just as classes were ready to be dismissed that day in Geneva Classical Academy in Lakeland, Florida, a 10-foot alligator wandered onto the campus, shocking students and teachers alike. A gator trapper was called around 2pm that day to deal with the reptile. As you could see in the video, the trapper prods it with a pole to guide it away from the vehicle before attempting to lasso it as students, parents and the school’s staff members watched from a safe distance. The alligator was eventually captured although not without thrashing and flipping around to thwart the trapper. Fortunately, no one was hurt during the incident.